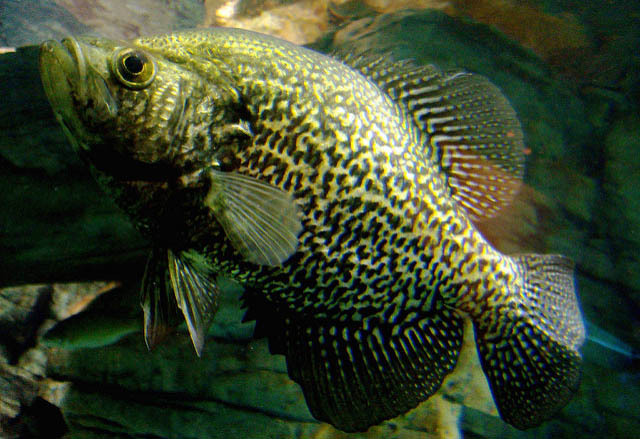 America’s favorite panfish, the crappie, can be found all across the United States. Anglers chase both black and white crappie from Lake Okeechobee in Florida to the Great Lakes. Crappie is found in rivers, reservoirs, lakes, ponds, and streams across this great nation. At different times of the year, crappie can be found either shallow or deep. They can be active or lethargic. Fortunately, much of crappie fishing depends on predictable seasonal shifts in their behavior. The most challenging aspect of catching crappie, and this article on crappie fishing tips, focused on locating them. larvae when young; as they grow, they eat minnows and fry. Both species of crappie get as big as about five pounds, though they average a pound or less. Due to longer growing seasons, crappie is, on average, larger in the south. Late winter is a time of inactivity for crappie. They’ve spent most of the cold water period suspended in deep water. They begin the cold water period suspended a few feet off the bottom, but seem to rise in the column as the season progresses. In reservoirs and lakes, look for crappie suspended over the structure in 20 to 30 feet of water. In shallower bodies of water, crappie will suspend over the deepest structure they can find. In rivers, these locations will be out of the current. As the water warms, fish will begin staging in shallower water. Please keep in mind that late winter is a relevant period, and fish will become active much earlier south in the south. Winter is the one time when crappie fishing are different for the north and south. For the northern angler, fishing through the ice is a great way to target lake and reservoir crappie. Drill numerous holes over structure 20 - 30 feet down. Jig with ice jigs, from the bottom of the water column up. If you are unable to catch any fish, or in the case of having a graph fail to mark any, move. For southern anglers who don’t enjoy the advantage of ice, late winter techniques will involve jigging for suspended crappie. Small presentations are best, hair jigs as small as 1/32 oz. or even 1/64 work well as do small jigging spoons. With the stable warming weather, crappie begins to drift from their deep water haunts. From the deep holes of natural lakes and reservoir, crappie begins moving to shallow bays, backwaters, and feeder creeks. In rivers, they move towards backwaters and oxbows. Long periods of stable weather will push crappie shallower, but a cold snap will see them hurrying back out deep and suspending 5 to 20 feet from the surface. As weather permits, crappie will orient to shallow structure, such as docks, lily pads, weeds, and downed trees. Once the water warms to near 50 degrees Fahrenheit, crappie becomes less nomadic, holding between a couple of feet of water and, say 10 feet. Continued warmer weather will push them near their spawning grounds. During stable weather, anglers should cast small crankbaits and jigs towards likely looking targets: dock pilings, weed edges, and trees. Jigs of 1/8th to a 1/32nd ounce are an idea for this fishing; tip the jig with small 1 -2“ grubs. No mention of the fishing tips would be complete without mention of Blakemore’s Road Runners. The lure jig combo is another excellent option to find willing fish. Anglers may also suspend a small minnow beneath a bobber. Once a crappie is caught, carefully work the area -- crappie are a schooling fish; where there’s one, there are usually a bunch! Crappie spawn between 60 and 70 degrees, provided the weather is stable. The spawning period usually lasts two weeks, females stay on the beds for up to a week, males remain a bit longer. Cold fronts, strong winds, and storm fronts stop crappie spawning activity. While crappie doesn't actively feed during the spawn, they can still be tempted to strike small jigs or minnows place near their nest. One of the few times anglers needs few fishing tips is during the spawn. Anglers should try moving even shallower than before, not fishing water much deeper than about 8 feet. Crappie can be spooky, so it’s a good idea to use only an electric motor, oar, or push pole in a boat. Long poles allow the angler to gently drop a small jig or minnow, and bobber, into small pockets in weeds or fallen trees. Hair jigs and small plastic grubs work well, even more so when tipped with live bait, minnows, or small pieces of worm. Once again, the Blakemore Road Runner is a sure bet for finding crappie. Once found with a Road Runner, they can be caught on a variety of presentations. Once the water temperature reaches 75 degrees, crappie moves into their summer patterns. Crappie move to the first break in lakes, and return to deeper water free from current in rivers, usually 15 to 22 feet down. In natural lakes, this break could be the wedding; in reservoirs, the first break is structural. Crappie may also be found in the creek channels of reservoirs. Schools of crappie roam these breaks in search of food, voraciously eating shad and aquatic insects. This period is the crappie’s most active of the year. Action for anglers centers upon finding active schools and determining what the fish are feeding upon. Once anglers catch a crappie, they should probe the area, using electronics if available, searching for others. Blade baits, crankbaits, and casting jigs and Road Runners are good ways to find active schools. Switching to jigs when on top of a school, and continuing to switch jigs and colors to keep fish interested will ensure continued success. Another way to fish for crappie involves using long poles in rod holders and trolling small 1/16th ounce jigs or Road Runners. Ensure that the rods are parallel to the surface of the water. Tip the jigs with minnows. Above the jig affix a cigar shaped float -- this allows the angler to control the depth. Use the trolling motor to keep the minnows above the broken line. To keep the presentation nearly vertical, add split shot as necessary above the jig and minnow combination. As water temperatures continue to fall, crappies move back to where they were found in the spring. At this time they are easy to catch. Fishing takes a turn for the worse as the waters cool to around the 50-degree mark. At this point, the warmer water cools enough to sink into the cooler water on the bottom. Oxygen becomes uniformly spread throughout the lake. Crappie becomes very difficult to find. Some stay in bays; some scatter into deeper water. Rivers don’t turnover; expect river crappie to slowly move to their deep water winter sanctuaries. Crappie fishing runs from very good to very difficult, depending on if a lake is pre or post turnover. Finding large numbers in the shallows is easy during the pre-turnover period. Cruising the shallows, casting crankbaits, jigs, or Road Runners almost guarantees success. After a turnover, there are no proven fishing tips as crappie abandon their schools and scatter throughout the lake. Using Road Runners in the shallows may allow the angler to catch enough lingering crappie to make it a successful day on the water. So, you’ve got a crappie fishing trip booked. Maybe you’re going to Reelfoot Lake in Tennessee or Okeechobee in Florida. Perhaps you’ve found a crappie lake nearby. No matter the location, you’ll need to bring the right equipment to make your trip enjoyable. Read on for suggestions. Crappie fishing usually means springtime fishing. When crappie are in the shallows, it’s hard to beat a long pole for placing small jigs and minnows into small pockets in the weeds. B’n’M makes poles in 10’ and greater lengths for just this kind of fishing. Crappie fishing is usually best with simple equipment. Small jigs, 1/4 oz. Down to 1/32 oz., with 1” and 2” twisters or tubes work well. Road Runners are another hot crappie bait. Small crank baits work well when searching for fish. The line should be 4 - 10 lb. monofilament. At times, crappie can be finicky biters. In this case, using small 1-2” minnows is your best bet. These can be hooked through the nose on small jigheads or size 4 or 6 hooks with split shot. Suspending the minnows under a bobber will keep the presentation vertical and make it easy to detect strikes. A long-handled net will allow you to land crappie. If you plan on keeping crappie, a stringer will hold your catch. To release crappie, a pair of needle-nosed pliers can prove invaluable in removing hooks. And, whenever handling hooks, a first-aid kid is a must. 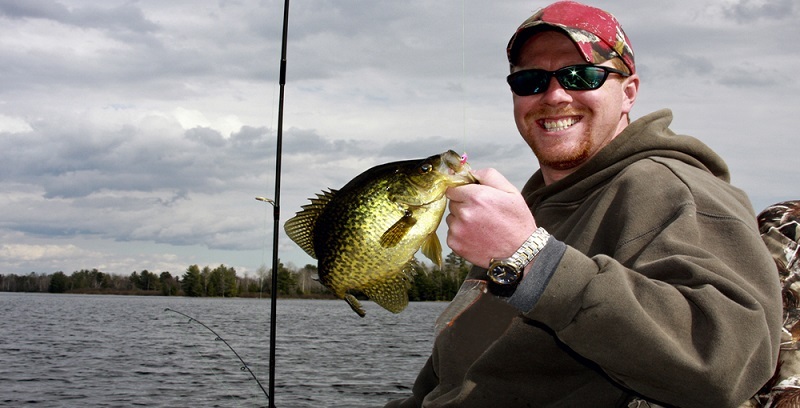 A fish finder can be a great asset for locating crappie. With the exception of fall turnover, crappie tends to stay in schools. Side-imaging can help locate crappie in the shallows in the spring and fall. In the winter and summer, use a fish finder to scan break lines, creek channels, humps, or other likely structure. Speaking of fish finder GPS combo, anglers can save a good deal of time by getting a map of the lake or river they want to fish. Using your knowledge of seasonal crappie movement, you can highlight areas to scan with your fish finder before getting to the water. There’s a lot to consider about the weather. Anglers should wear sunscreen to protect from the sun’s rays. The importance of an extra rain suit in case of pop up showers can’t be understated. Windy days may require boaters to anchor in both the bow and stern. Clearly, dress for the elements. A long-brimmed hat reduces glare. Shirts designed for anglers offer ventilation and sun protection. Polarized sunglasses reduce glare, allowing the angler to see into the water while reducing eye strain. To make the trip memorable, bring a camera to take photos. Keep it, and any other valuables/electronics, fly tying vise, in a waterproof bag. While it’s impossible to plan for every contingency, this list should give you a good starting point in making your next crappie outing a successful one. The crappie is America’s favorite panfish, drawing anglers young and old, for some reasons. Crappie can be caught year-round, are quality table fare, and grow to a respectable size. They can be caught with rudimentary equipment -- cane poles and light tackle -- in the spring, and in large numbers. With the crappie fishing tips in this article, you should be well on your way to catching crappie in the coming year. And, due to their prolific spawning and advantages feeding on a variety of food, you shouldn’t feel guilty about selectively harvesting a few for the table.